Whirlpool is proof sometimes a failed venture can turn into a success. In 1908, Lou Upton invested all of his life savings into a company to manufacture household equipment. The company failed to take off and the other investors agreed Lou could acquire one patent from their many machines. Lou ended up choosing a manual clothes washer machine. Emory Upton, Lou's brother, operated a machine shop. Lou approached him and inquired if they could redesign the manual clothes washer and incorporate an electric motor. With the help of Lowell Bassford providing a $5,000 investment, the Upton Machine Company was founded in 1911 and they began manufacturing electric-motor-driven clothes washing machine. This 'wringer' washer grabbed the attention of the electrical company, Commonwealth Edison. The company's Federal Electric division ordered 100 machines from Upton but soon discovered a fault in the gear transmission. Rather than accepting a return and refunding their money, Upton recalled and repaired each machine. This leads to Federal Electric doubling their initial order and remaining a customer for three more years until they started to produce their own washing machines. In 1916, Sears, Roebuck & Co. started selling Upton's washer under the 'Allen' brand name. Sales took off and Sears relied solely on Upton to supply their washers. With a lesson learned from their deals with Federal Electric, Upton began marketing their own brand. In 1929, Upton acquired the Nineteen Hundred Washer Company and changed their name to Nineteen Hundred Corporation. The company made it through the Great Depression without much damage to sales, and during World War II the factories switched over to armament production. In 1947, the company introduced a new automatic, spinner-type washer that was marketed by Sears under the 'Kenmore' brand name before being re-marketed a year later under the 'Whirlpool' brand name. The company name was changed from the Nineteen Hundred Corporation to the Whirlpool Corporation in 1950. The creation of the Whirlpool Foundation, a philanthropic gesture, was founded a year later. Today, Whirlpool is the largest manufacturer of major appliances in the world with annual revenue exceeding $19.9 billion. Unfortunately, Whirlpool central vacuums are no longer in production. 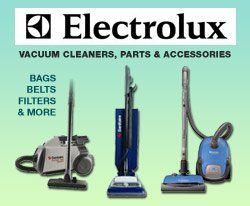 However, we offer a full line of accessories and replacement parts for your Whirlpool central vacuum system.